Home » Blog » Rank 126 UPSC CSE 2016 Mani Agrawal, UPSC/IAS TOPPER’S STRATEGY-Importance of TLP Mains Answer Writing! Rank 126 UPSC CSE 2016 Mani Agrawal, UPSC/IAS TOPPER’S STRATEGY-Importance of TLP Mains Answer Writing! My name is Mani Agarwal. I am from Agra. I did BSc Honours Mathematics from Hindu College, Delhi University and MSc Mathematics from IIT Bombay. 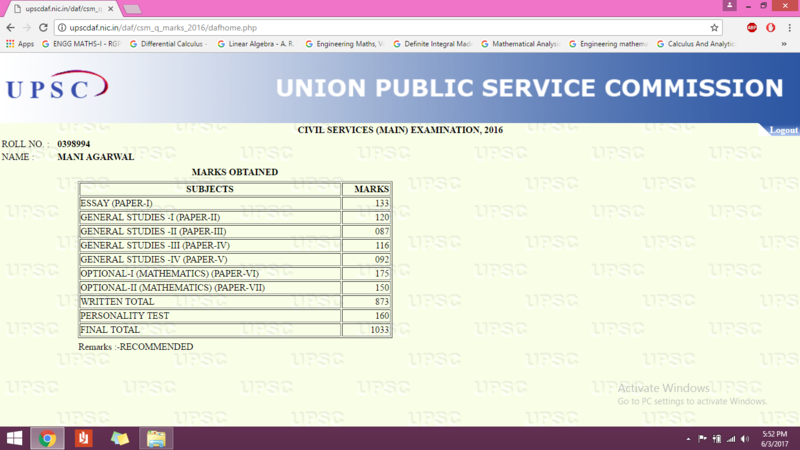 I cleared UPSC exam in 2nd attempt with optional subject Mathematics. In my 1st attempt, I reached till interview stage but missed the final list by 40 odd marks. I always thought to give my first attempt with full preparation with a goal of clearing the exam in first attempt. Irrespective of success, I think this should be the mindset of all aspirants. Although this doesn’t ensure rank, it makes one’s preparation rock solid. And this helps in future attempt. I think that worked for me a lot. If we have an attitude that there are more attempts to clear than our preparation becomes half-hearted. My knowledge about this exam started when I was in school my mamaji used to say to my mother that she should make me an IAS. So technically it was IAS and not UPSC that I came to know about first as happens with mot aspirants. This idea grew during graduation when I met many people in DU who were preparing. Eventually I made my mind and committed myself to this journey. It was not a real social incident that encouraged me for this service. But yes, during preparation I understood the value of this service. I began my preparation in BSc Honours 2nd year by reading The Hindu. Till then I was not aware of this newspaper and how one should go about it. I gave myself time to read it, enjoy it and also digest it. Earlier it was very difficult to read the full newspaper and I used to feel sleepy but I made it a regular practice to read it. I didn’t make any notes at that time. I talked to some seniors in my PG who were preparing and came to know about the importance of optional. As I was good in Maths, there was never any question/doubt about which optional I will take. Some people told me that Maths is not scoring and it can doom you, I trusted my intuition. But yes, I understood in 2nd year that BSc will not be enough to get me through. I need to have Masters in Maths. So, essentially my graduation was spent in excelling in college and preparing my foundation for a good post –graduation. I didn’t start studying for any GS/Essay in graduation. Rather from my 3rd onwards I started for IIT-JAM (Joint Admission for Mathematics). When I reached IIT, my mind was clear. I have to solidify all my concepts in maths with a higher level reading of The Hindu. This included reading Hindu and also preparing some notes about what I understood. I read previous years papers extensively, literally googling where those questions were framed from. This was exhausting and time consuming but I didn’t give up. Rather I gave up my 1st summer vacations and stayed in hostel to read Hindu and preparing my own notes. It was there I had a discussion with one lady who was in IFS. She gave me excellent guidance about preparing notes. I transformed my preparation form hard to soft copies. It was easy to maintain, add, delete, modify on laptop. I ensured that I didn’t compromise on my life in IIT and fully enjoyed each moment, participated in dance festivals, debates, class trips because I was regular in reading newspapers, preparing for IIT exams and making notes. When I came out of IIT in May 2014, I was 100% sure that I don’t have to take coaching. My foundation and “understanding” of UPSC exam was clearer. I was able to find how ques might be framed from any news. I decided to stay at home and prepare. I decided to give 2015 attempt with full preparation. It was now that I started reading books for the exam and making my own notes, both hand written and typed. I kept in mind that I am preparing for mains. Maths preparation was also kick-started. I fixed my after dinner time for maths. I made notes for prelims side by side; about news that were not extensive but could me asked in MCQs. For others, it was Mains notes that could help. I completed the syllabus by reading and preparing notes for the first time by December 2014. It was then that multiple revisions started. Side by side maths was going. By first prelims was in August 2015. I started to read only Prelims in May 2015. Mains preparation was reduced if not completely side-lined (because of current affairs). I used to solve many MCQs from online websites. I joined one small test series of 10 full tests in June 2015. CSAT preparation was also started from May only. Since I was good in maths it was not a big deal. TLP- Programme. I didn’t know then that this programme will be my SOLE GUARDIAN for mains. I started writing answers from next day. i thought that I will continue writing and let’s see if somebody evaluates my answers. Normally on online platforms it is very difficult/ not possible to fix accountability as they are free of cost and you don’t know people personally, it is your time and your practice that is at stake. But IAS BABA was different. I still remember my answer was evaluated the very 1st day! Of course I needed to improve but someone telling that created a lot of enthusiasm and positivity. I wrote answers for 5 questions in TLP program each day and everyday there were evaluators who were reading my answers, sometimes all 5 and sometimes at least 3 if not all. But then there were other aspirants who checked my answers and gave their comments. It was this consistency in IAS BABA team that I never gave up mains answer writing till November end. It helped me groom my writing skills. I kept a 35 minute timeline for answering these 5 questions to create exam feel each day. I didn’t join any test series for my optional and had to pay for it. I gave the mains and cleared it but couldn’t get the final rank. It was my optional that doomed me. I scored a mere 208/500. But as far as IASBABA was concerned, the practice did its work, I scored around 360 in GS. I decided to give second attempt. With people going for some very costly test series I was pretty sure that my trust in IASBABA will pay off. I stuck to IASBABA, this time for both prelims and mains. Since I had to catch with my current affairs within less time, the summary versions of Yojana/Kurukshetra Magazines by IASBABA were very helpful. They started an amazing 60 day prelims plan which I regularly practiced. I didn’t join any other test series for prelims. Then it was TLP again and the team was again at its very best at evaluating mine and other aspirants’ answers. I was very positive about IASBABA from the very start and didn’t go for any other platform. But this time I joined a test series for maths by IMS. The hard work paid off and I cleared Mains. For interviews, I took part in interview discussion initiative by IASBABA for keeping in touch with the kind of theoretical questions that can be asked. Also, joined interview guidance program by Samkalp (2 mocks) along with 1 mock each from Chanakya IAS Academy and Vajiram and Ravi. As I now see my mark-sheet, I realise the important role of IASBABA in making me score high in GS in Mains. It is one thing that you are very particular about answer writing but it another to have a belief that your answer will be evaluated and you can improve. Without evaluation one seems to lose enthusiasm to write each day. It was this enthusiasm that kept the fire burning in me and I hope in all the future aspirants. I heard some negative opinions about Mathematics as an optional subject for UPSC. I think that we should listen to other people but decide on our own as to what suits us. Despite being a low scorer in my 1st attempt I didn’t lose faith in my subject and I realised my mistake of being over confident in being a post graduate in Mathematics. We should prepare a subject if we enjoy it (if we take a new subject altogether) or if we have a strong hold on it (as in my case) but should never be over confident about it. For people in maths, I want to tell that don’t break the chain of regular practice even when you are studying when Prelims exam is near. Reduce the time given to maths but don’t give it altogether. UPSC exam is one which checks not just your knowledge but also your approach towards life and its problems. It tests you on your patience, mood swings, courage and persistence. Also, anyone can crack this exam with proper planning and suitable timetables. Regularity and consistency with support systems like IASBABA is a necessary recipe for acing this exam. I wish all the aspirants very best for the upcoming Prelims 2017. With less than a fortnight left, brush up the facts, solve MCQs and pray for positivity in thinking from Almighty. Don’t overthink and overanalyse. Keep calm and excel.